That approach… not ideal. Tiger runs it way past the hole and can’t do much other than accept his par and keep moving. He didn’t take the conventional route, but Woods finds his fourth birdie of the day. Let’s see what he’s got for the Par 3 ahead. And there it is! Woods doesn’t make any mistakes with the putter this time. Hey, is that a smile? Tiger works his way out of the bunker, tacking on another par. He’s now six shots behind the leader with a bunch of golfers in the way. Oh boy. That one hurts. 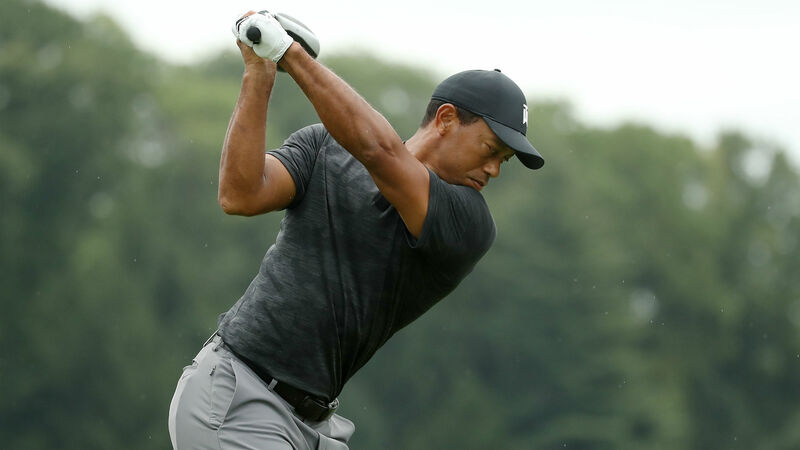 Woods can’t connect on one of his best openings of the day. That feels worse than just a par. It’s par-a-palooza 2018! After a couple early birdies, Tiger rattles off seven consecutive pars on the Front 9. He’s had chances, but he can’t find the touch on the green. Woods splits the fairway, but his approach lands 20 feet away. He can’t recapture his early putting magic. Put a par on the board. Tiger’s drive finds the fairway bunker, leaving him in a difficult spot, but he avoids his first bogey. Nice save. Woods’ drive sends him into the rough, but he recovers to reach the green. He can’t sink a long birdie opportunity, and he taps in for par. Tiger sets up for another birdie, but he can’t finish it off this time. The streak ends here.